a refined rating system: this gives you an indication of how easy or difficult the walk is. We hope you enjoy these new features, and let us have your feedback as you explore. In our latest prize draw we will be giving away an Ordnance Survey Custom Made map worth £16.99 to three lucky individuals. Ideal for anyone who loves the countryside, you can now get a personalised map direct from Ordnance Survey. You select a centre point and scale and then add your own cover photo and title to create a unique gift. There’s also the option of a framed map, which makes an ideal addition to any study. 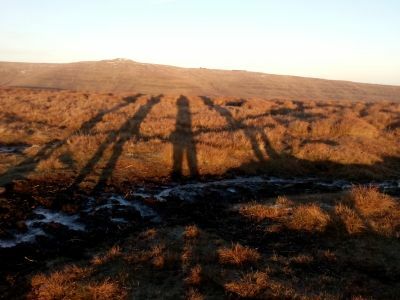 We headed for the Black Mountains at the turn of the year. The weather was changeable (to put it mildly) but the scenery was as stunning as it always is in this corner of Wales. And the tea and cakes weren’t bad either. In fact, the weather for much of the winter was pretty poor for walking. So why not try our tips for winter walks this spring instead? The Settle–Carlisle line celebrated its reopening after landslides by running steam services in February. Which seems like a good reason to recommend one of our favourite routes from the line – this classic from Dent to Ribblehead? We are pleased to announce Infinite Playgrounds and Leisure Lakes Bikes as our latest sponsors! Many thanks for getting involved and supporting our work.